You know those conference name badges with the colorful ribbons that say "Speaker," "Sponsor" and the like? Silly as it seems, it does make you think. 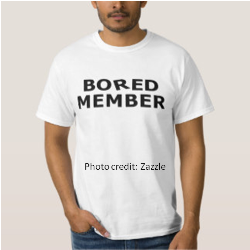 Does your nonprofit have "bored members?" Are you one yourself? More importantly, how do you change that? IF YOU'RE THE BOARD CHAIR, here are some tips to create more engagement and ensure your board members are anything but bored at meetings. Your meeting package might include this month's meeting agenda, the previous meeting's minutes, the current financial reports and any committee reports. That way, board members can read them all in advance, instead of listening to one report after another at the meeting. Why is this important? When you spend less time listening to committee reports, your board members can engage in more dialogue about important issues. Share a "mission moment" at every meeting. Each meeting, take a few minutes to share a story about the good work of your organization. Mix it up! - Ask staff tell a specific story about a client: How has their life changed or improved? - Invite a program beneficiary to tell their own story: How has this program helped you? - Ask a volunteer or donor to share: Why do you give time and/or money to our cause? - Encourage board members to tell their own story: Why did you decide to join this board? Why is this important? Sharing stories (especially success stories) connects people to the cause, and reminds everyone about the important work your organization is doing. Make board development a priority. Dedicate time for discussions and training that will help your board members become better board members. This includes everything from understanding your roles and responsibilities as board members to learning The Ultimate Board Member's Book, Kay Sprinkel Grace reminds us that all board members have a responsibility to evaluate their own effectiveness as a board member. Do I still have the time, energy and commitment to serve as a productive board member? How would I rate my own performance as a board member relative to the performance of others? Top, middle or bottom third? What are my strengths? How do I feel I've used them to help this organization? How could I use them better? After you've answered these questions, talk to your board chair. Share your experiences  and your ideas. You'll be glad you did, and your board chair will, too. Regardless of your position on the board, you can take steps to make the experience a good one  no, make that a great one  for you and your fellow board members. If you're thinking about board training in 2016, let's talk! I'd love to customize a training program just for you and your board. Choose from one-hour to full day. Contact Laura for information. If you're looking to move your board members (and board meetings) from boredom to nonprofit stardom, then don't miss this month's resources.